Peat is a highly variable material and some site investigation will always be necessary to inform the design and limit any potential for failure. This investigation need not be extensive or expensive but should be done in all cases, and always by suitably qualified professionals with experience of road construction on peat. Typically the investigations will need to establish the depth of the peat deposit and its variation, the type of peat present and the presence of any compressible layers beneath. These results will form the basis of the preliminary Geotechnical Risk Register. All site investigations should have an aim however, and only those investigations that are actually necessary to provide the information for the design should be carried out. Too often hard pressed engineers are tempted to omit site investigation on the grounds of economy and speed. This is always a mistake. Roadworks involving peat must always be based on sound collected data. There will normally be an economic limit on the amount of site investigation that will be able to be carried for a low volume road due to the budgetary and time constraints placed on the engineer. A wide range of possible methods exists and it will be necessary to select the most appropriate combination for the particular site to ensure that all relevant information is collected to allow a proper analysis to be made. Sampling Invasive ground investigations for obtaining physical samples for use in determining the thicknesses and properties of the road structure, subgrade and peat layers. Coring & sampling can also provide useful data to calibrate and supplement other methods. Some sampling should always be carried out. Penetration Testing Similar to probing but with the probe measuring the relative stiffness and strengths of the layers that it passes through. Can be a useful method when there are layers of peat and other materials below the road. Further details regarding these techniques can be found in the ROADEX II project reports. The desk study and site walkover are vital precursors to the main site investigation, and the subsequent analysis of the site, but it will seldom be cost-effective to use all of the other investigation methods listed. The site visit and ’walkover’ is one of the most important elements of the site investigation. The existing road, or the proposed line of road for a new alignment, is the “full-scale model” for the project and provides the best information on the problems that are likely to arise and which must be taken into account in the design. The site visit and walkover also gives the opportunity of seeing the surface features of the peat first hand, e.g. ditches, watercourses, subsurface pipes, surface topography, peat workings, waterlogged areas, areas of free water, etc, and making an assessment how these can be accommodated in the works. 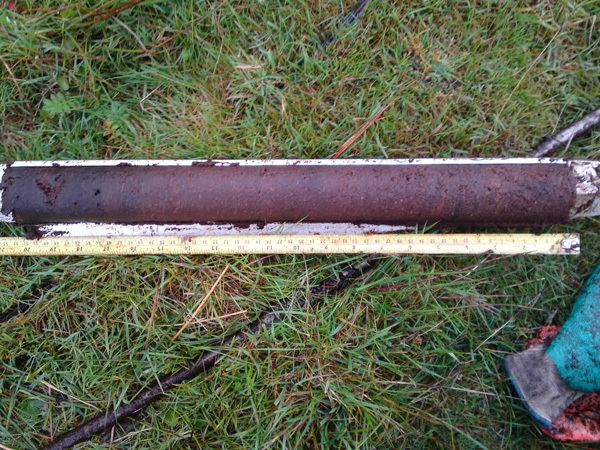 Simple probing can be used to establish the depth of a peat layer. This is usually carried out with steel rods approximately 1m long with bayoneted or threaded connections to permit the rods to be assembled to a length to suit the depth of peat. 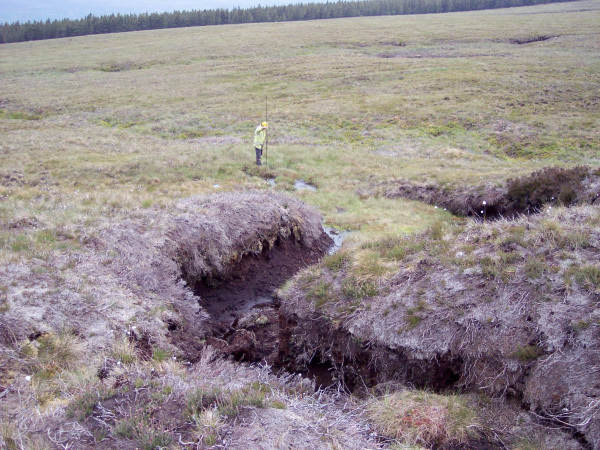 Where the peat overlies a hard surface such as moraine or rock a probing survey can produce a good indication of the thickness of the peat. Greater probing difficulty arises where there are soft compressible layers within the peat, such as clay, gyttia or silt, gravel layers from old flooding episodes, or even chunks of woody materials. Here probing alone cannot differentiate between the differing materials and a more sophisticated weight probing or cone penetrometer will be necessary. GPR is commonly used in investigations on existing roads. Depending on the antenna used a GPR survey can give good information on the structural layers of the existing road, the overall thickness of the road embankment, the depth of peat and any compressible layers within it. 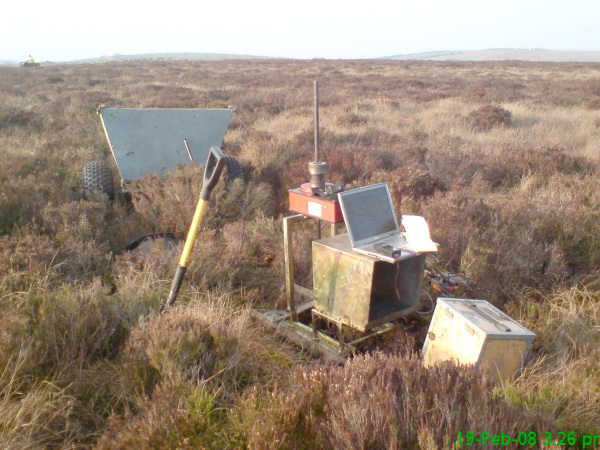 GPR can also assist in the prediction of settlement on peat by giving information on the settlement that has already occurred due to the existing weight. This can be used to calibrate settlement analyses for new layers and/or widening. The use of GPR is discussed in Section 4.1.7 of the “Permanent Deformation” elearning lesson. Some investigation of properties of the peat should always be carried out to get a notion of the type of peat involved. This can be as simple as a Von Post classification of the peat, and an estimation of water content if settlement calculations are to be attempted. Undisturbed peat samples can be difficult to obtain however especially in peats with a high water content. 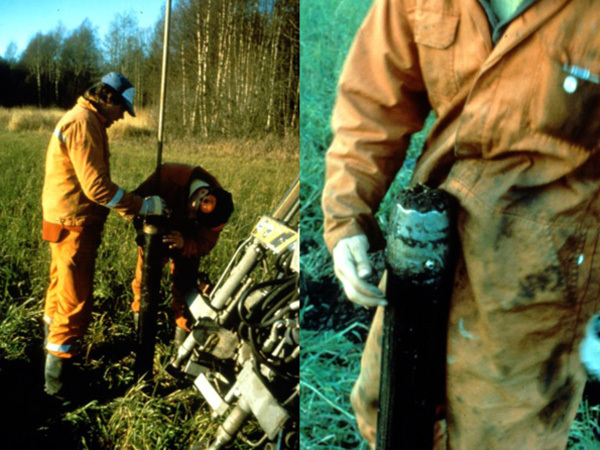 A simple and effective sampler has been produced by the Swedish Geotechnical Institute (SGI) to overcome this. The SGI sampler has a sharp circular wave-toothed cutting edge mounted on 100mm diameter plastic tube capped with a driving head on top. The length of the tube is variable and dictates the length of sample recovered but normally a 1.0m long sampler is sufficient. It has been found that the best results are usually achieved when the sampler is driven down into the peat by means of gentle tapping with a hammer or a lightweight percussive machine. Hand auger sampling of peat is also possible, and much better than no samples. 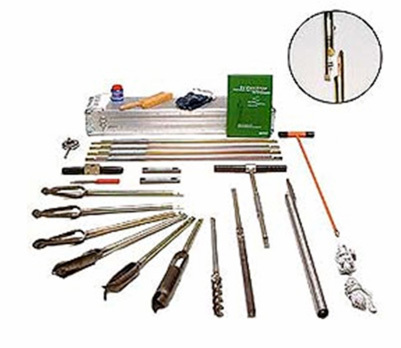 A large range of hand augers exist on the market that can recover a sample from depth to enanble a simple classification of the peat type to be carried out. In road widening projects it is important that the consolidated peat below the existing road is sampled as well as the peat beside the road to ensure that both old and new act together in the finished structure. Getting an estimation of the insitu undrained shear strength of a peat area is not easy due to the great variability of peat, both horizontally and vertically. For fibrous peats the absence of an actual measured figure need not be a problem, but an estimate of the shear strength should be obtained for a highly humified peat, particularly where the loadings on the peat will be significantly increased by the construction of the new infrastructure. An indication of shear strength may be obtained in the field by using a shear vane test but the results obtained must be treated very cautiously. 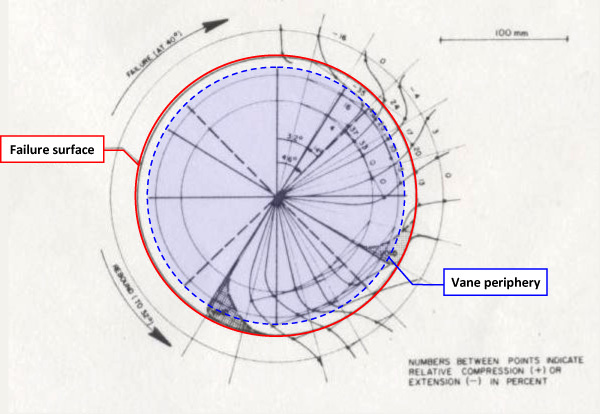 The shear vane test is relatively simple to perform and understand but research (Landva 1980) has shown that the failure in peat does not necessarily occur on the edge of the vane but on a failure surface 7mm to 10mm outside the vane due to the tearing effect of fibres. 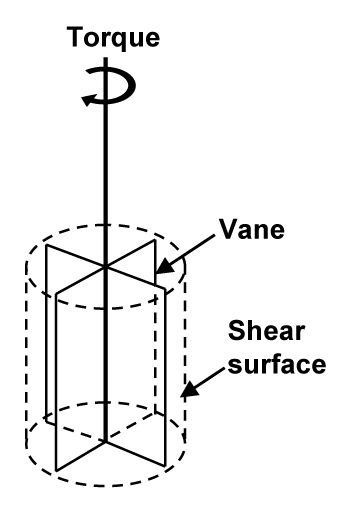 Any shear strength results derived from a field vane test should therefore be treated very carefully and an appropriate conservative correction factor used. It is not possible to give a hard recommendation for this factor but the ROADEX view is that the vane shear strength obtained in the field should be divided by at least 2, i.e. it should be halved, before it is used for design purposes. GPR for thickness and construction of existing road (1.5GHz and 400MHz), depth of the peat layer (275MHz). These levels of investigation will enable to engineer to review of all of the data available, conduct an initial site impact assessment, start the geotechnical risk register, and decide whether any further intrusive ground investigations are necessary. 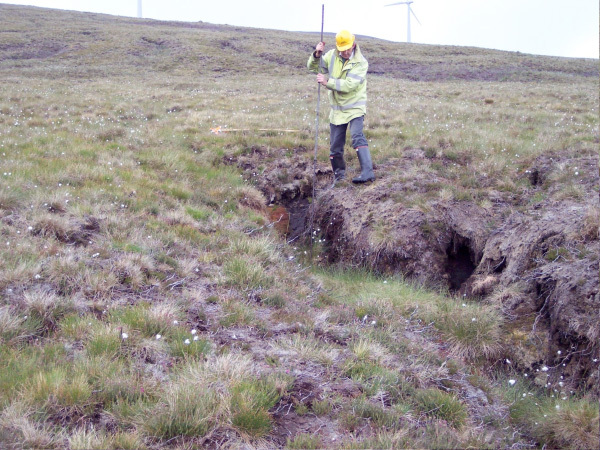 The specialist detailed intrusive ground investigations that can be carried out for peat are outwith the scope of this lesson and are best commissioned with the assistance of an experienced geotechnical consultant and carried out by a ground investigation contractor experienced in peat investigation. Laboratory tests are normally set out to replicate the conditions that are expected to be encountered on site. This is difficult to do for peat, particularly fibrous peats with very high water contents and permeability, due mainly to the difficulty in getting representative undrained “undisturbed” samples and transporting them to the laboratory intact. It is possible to take large samples and test them in large testing apparatus but this is not normally available to non-research engineers working in local roads offices. For this reason it is unusual for low volume road projec ts to commission laboratory testing of peat samples from the field. Testing can of course be carried out if deemed necessary. 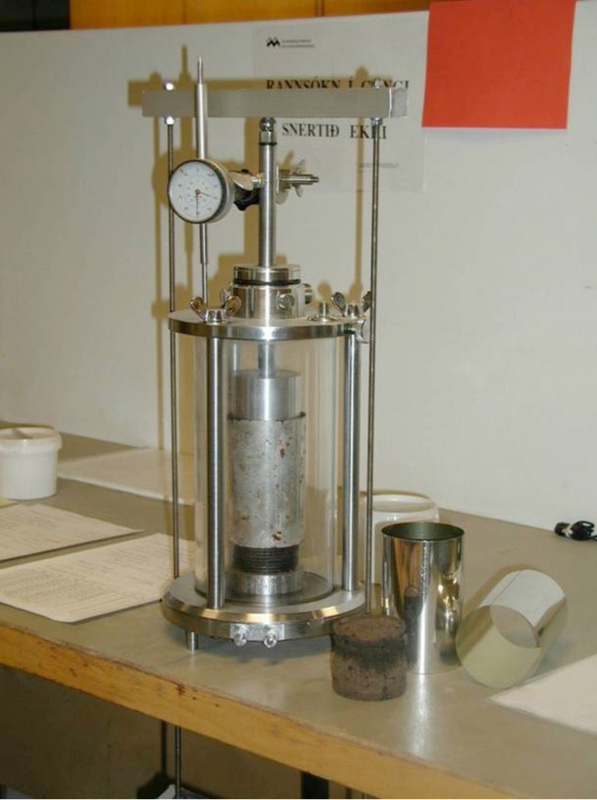 The Swedish Geotechnical Institute use a direct shear apparatus and compressiometer which allows large deformations to be produced in peat samples. The Icelandic Roads Administration uses an oedometer to obtain the basic peat parameters for their Janbu settlement analyses. However for projects on low volume roads the simpler ‘classification tests’ outlined in Section 1 are generally all that are used, together with empirical relationships to produce some guidance on the likely behaviour of the peat insitu. Classification and water content are the most commonly specified and these two tests can probably be considered to be the minimum amount of testing required for best practice. With knowledge of the water content it is possible to get a good approximate calculation of settlements and consolidation with the STA method outlined in section 5.3.2.